The second observing run (O2) of the advanced gravitational wave detectors is now over, which has reminded me how dreadfully behind I am in writing about papers. In this post I’ll summarise results from our first observing run (O1), which ran from September 2015 to January 2016. I’ll add to this post as I get time, and as papers are published. I’ve started off with papers searching for compact binary coalescences (as these are closest to my own research). 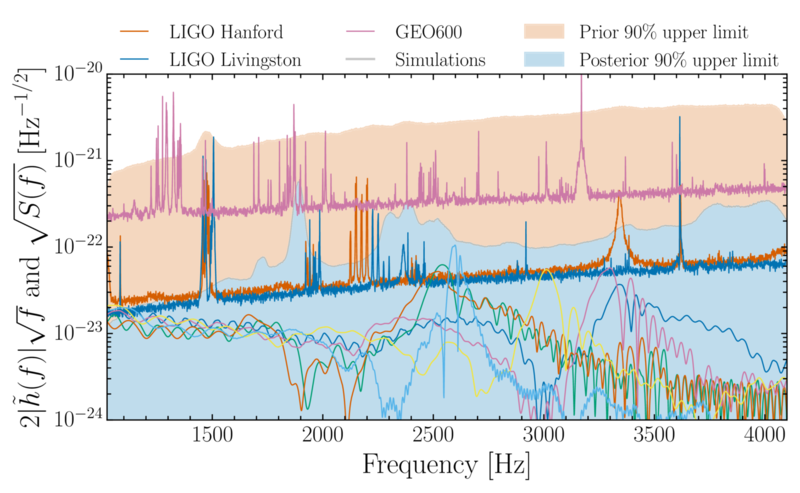 There are separate posts on our detections GW150914 (and its follow-up papers: set I, set II) and GW151226 (this post includes our end-of-run summary of the search for binary black holes, including details of LVT151012). Our main search for compact binary coalescences targets binary black holes (binaries of two black holes), binary neutron stars (two neutron stars) and neutron-star–black-hole binaries (one of each). Having announced the results of our search for binary black holes, this paper gives the detail of the rest. Since we didn’t make any detections, we set some new, stricter upper limits on their merger rates. For binary neutron stars, this is . Some binary neutron star or neutron-star–black-hole mergers may be accompanied by a gamma-ray burst. 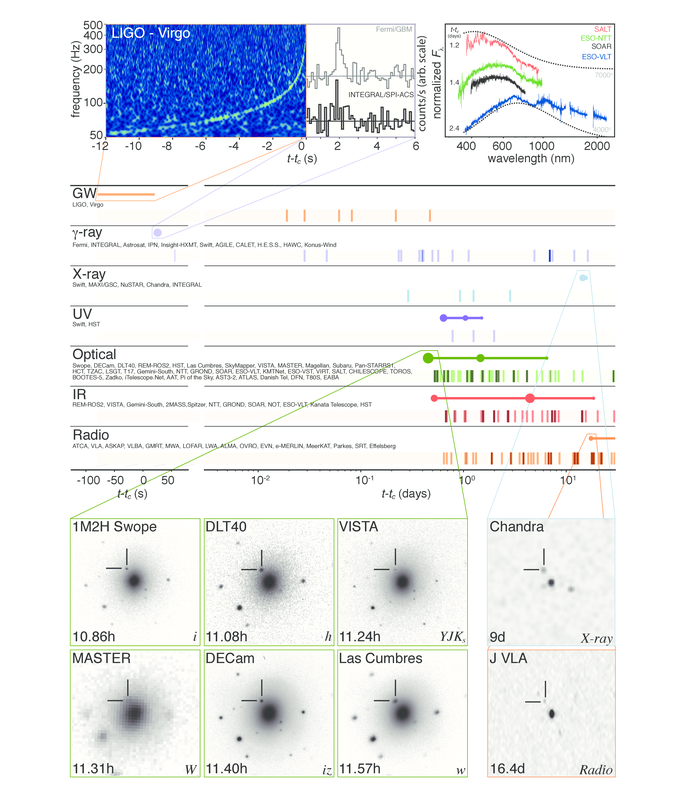 This paper describes our search for signals coinciding with observations of gamma-ray bursts (including GRB 150906B, which was potentially especially close by). Knowing when to look makes it easy to distinguish a signal from noise. We don’t find anything, so we we can exclude any close binary mergers as sources of these gamma-ray bursts. Our main search for binary black holes in O1 targeted systems with masses less than about 100 solar masses. There could be more massive black holes out there. Our detectors are sensitive to signals from binaries up to a few hundred solar masses, but these are difficult to detect because they are so short. This paper describes our specially designed such systems. This combines techniques which use waveform templates and those which look for unmodelled transients (bursts). Since we don’t find anything, we set some new upper limits on merger rates. If we only search for signals for which we have models, we’ll never discover something new. Unmodelled (burst) searches are more flexible and don’t assume a particular form for the signal. This paper describes our search for short bursts. We successfully find GW150914, as it is short and loud, and burst searches are good for these type of signals, but don’t find anything else. (It’s not too surprising GW151226 and LVT151012 are below the threshold for detection because they are longer and quieter than GW150914). 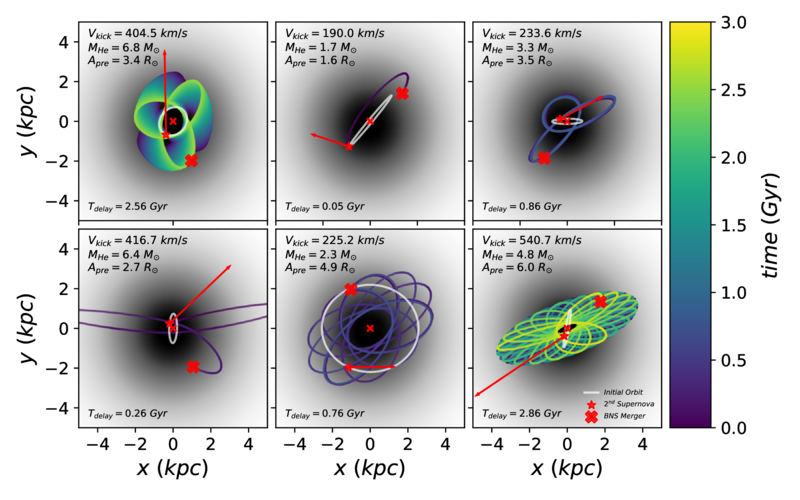 The Compact Binary Coalescence (CBC) group target gravitational waves from three different flavours of binary in our main search: binary neutron stars, neutron star–black hole binaries and binary black holes. Before O1, I would have put my money on us detecting a binary neutron star first, around-about O3. Reality had other ideas, and we discovered binary black holes. Those results were reported in the O1 Binary Black Hole Paper; this paper goes into our results for the others (which we didn’t detect). 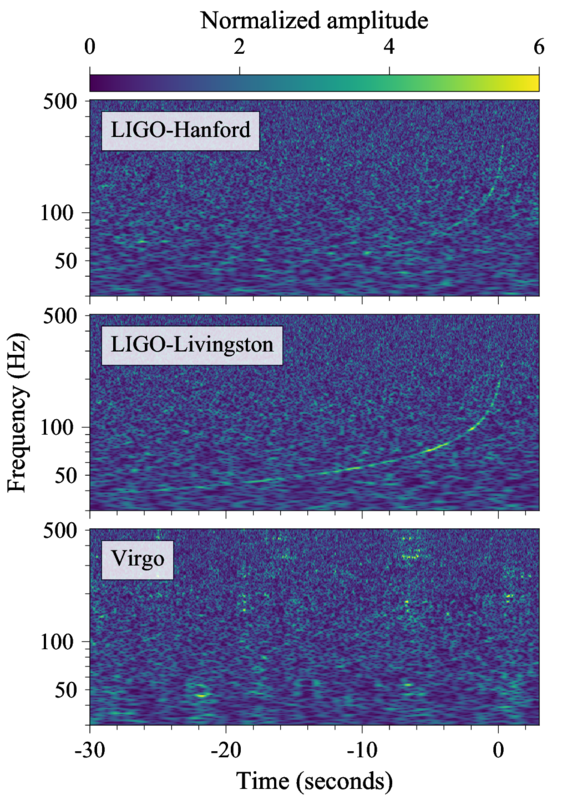 To search for signals from compact binaries, we use a bank of gravitational wave signals to match against the data. This bank goes up to total masses of 100 solar masses. We split the bank up, so that objects below 2 solar masses are considered neutron stars. This doesn’t make too much difference to the waveforms we use to search (neutrons stars, being made of stuff, can be tidally deformed by their companion, which adds some extra features to the waveform, but we don’t include these in the search). 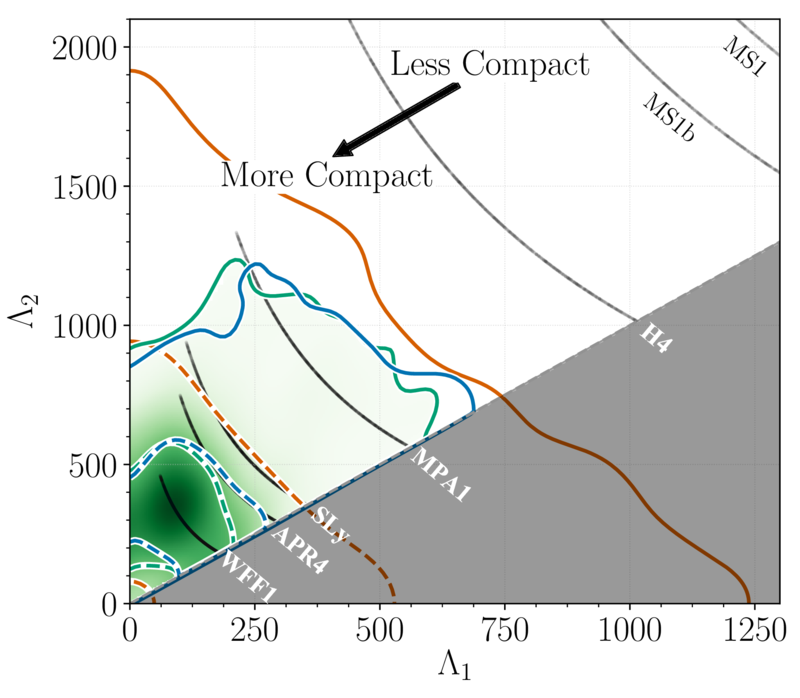 However, we do limit the spins for neutron stars to less the 0.05, as this encloses the range of spins estimated for neutron star binaries from binary pulsars. This choice shouldn’t impact our ability to detect neutron stars with moderate spins too much. We didn’t find any interesting events: the results were consistent with there just being background noise. If you read really carefully, you might have deduced this already from the O1 Binary Black Hole Paper, as the results from the different types of binaries are completely decoupled. Since we didn’t find anything, we can set some upper limits on the merger rates for binary neutron stars and neutron star–black hole binaries. where is the merger rate, and is the surveyed time–volume (you expect more detections if your detectors are more sensitive, so that they can find signals from further away, or if you leave them on for longer). We can estimate by performing a set of injections and seeing how many are found/missed at a given threshold. Here, we use a false alarm rate of one per century. Given our estimate for and our observation of zero detections we can, calculate a probability distribution for using Bayes’ theorem. This requires a choice for a prior distribution of . We use a uniform prior, for consistency with what we’ve done in the past. and hence , so results would be the same to within a factor of 2, but the results with the uniform prior are more conservative. 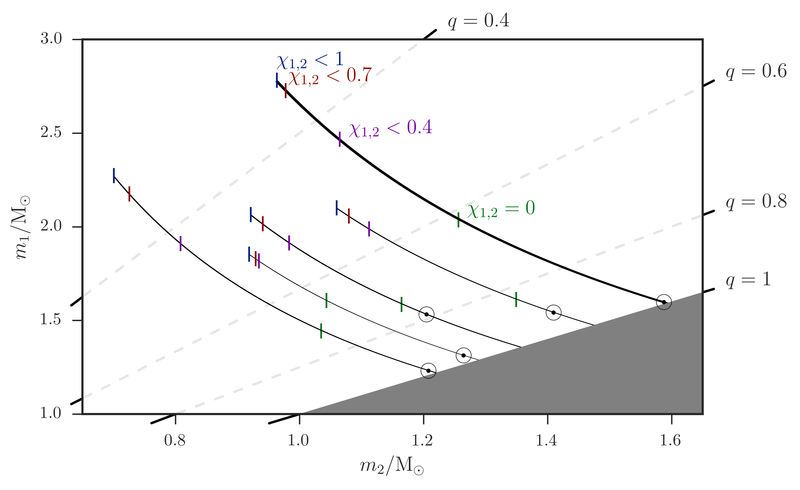 The plot below shows upper limits for different neutron star masses, assuming that neutron spins are (uniformly distributed) between 0 and 0.05 and isotropically orientated. From our observations of binary pulsars, we have seen that most of these neutron stars have masses of ~1.35 solar masses, so we can also put a limit of the binary neutron star merger rate assuming that their masses are normally distributed with mean of 1.35 solar masses and standard deviation of 0.13 solar masses. This gives an upper limit of for isotropic spins up to 0.05, and if you allow the spins up to 0.4. 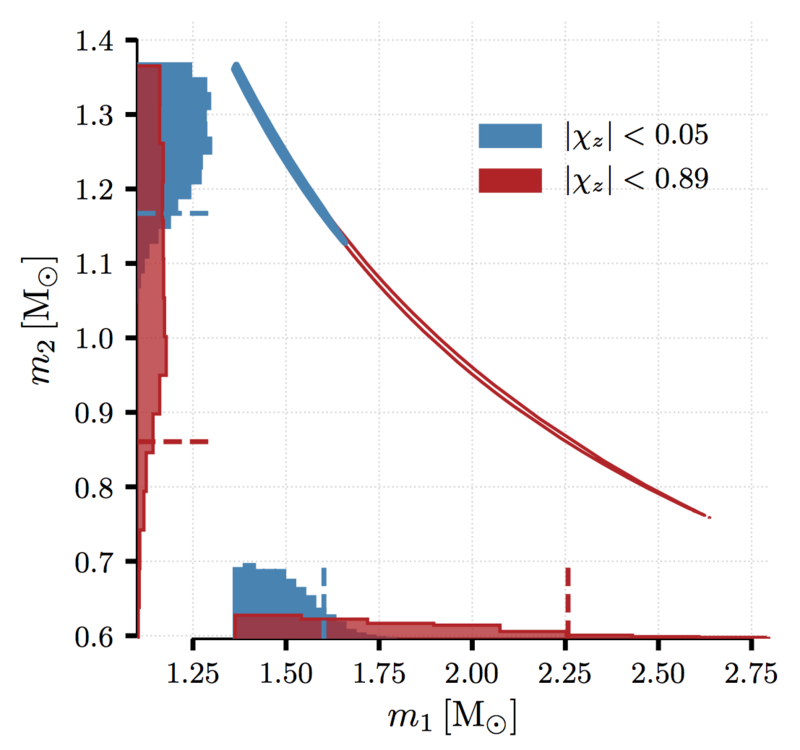 90% confidence upper limits on the binary neutron star merger rate. These rates assume randomly orientated spins up to 0.05. Results are calculated using PyCBC, one of our search algorithms; GstLAL gives similar results. Figure 4 of the O1 Binary Neutron Star/Neutron Star–Black Hole Paper. For neutron star–black hole binaries there’s a greater variation in possible merger rates because the black holes can have a greater of masses and spins. 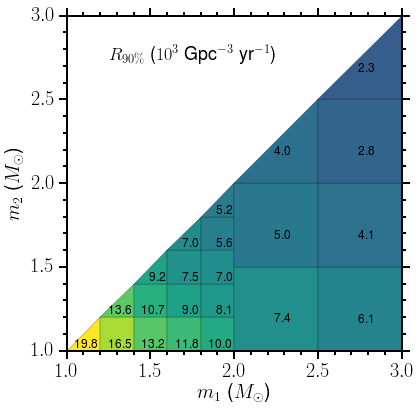 The upper limits range from about to for a 1.4 solar mass neutron star and a black hole between 30 and 5 solar masses and a range of different spins (Table II of the paper). It’s not surprising that we didn’t see anything in O1, but what about in future runs. 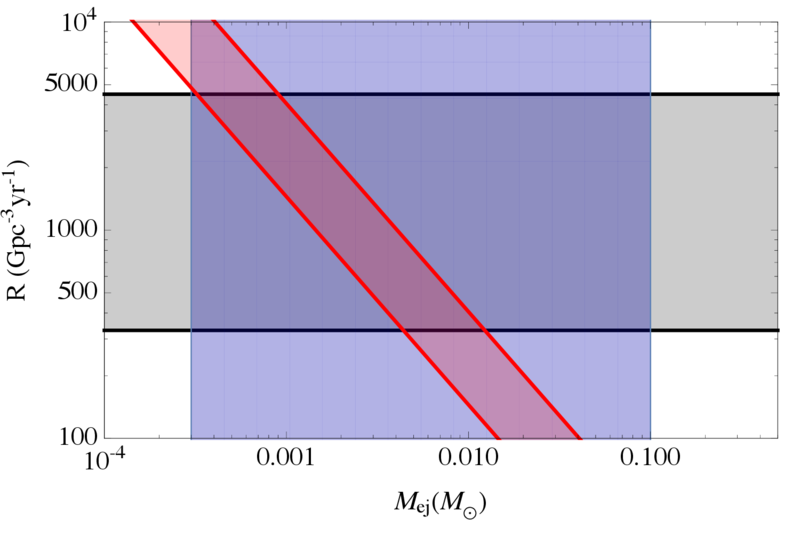 The plots below compare projections for our future sensitivity with various predictions for the merger rates of binary neutron stars and neutron star–black hole binaries. A few things have changed since we made these projections, for example O2 ended up being 9 months instead of 6 months, but I think we’re still somewhere in the O2 band. We’ll have to see for O3. From these, it’s clear that a detection on O1 was overly optimistic. In O2 and O3 it becomes more plausible. This means even if we don’t see anything, we’ll be still be doing some interesting astrophysics as we can start ruling out some models. 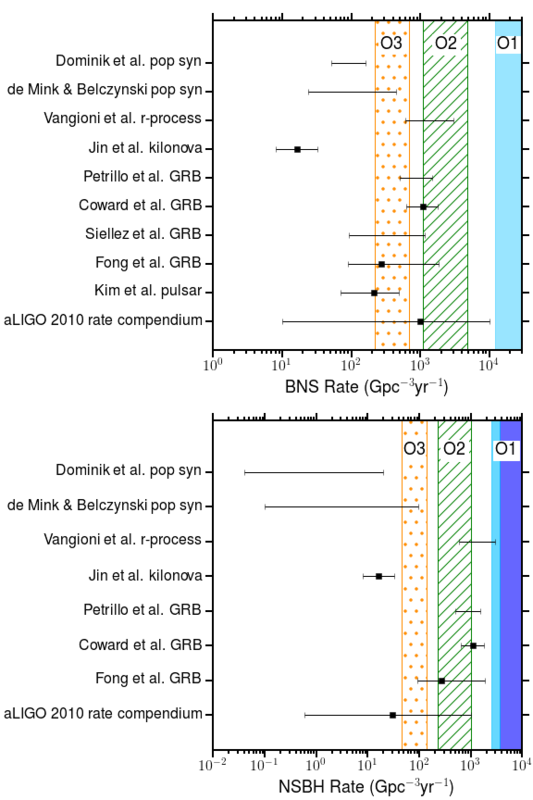 Comparison of upper limits for binary neutron star (BNS; top) and neutron star–black hole binaries (NSBH; bottom) merger rates with theoretical and observational limits. 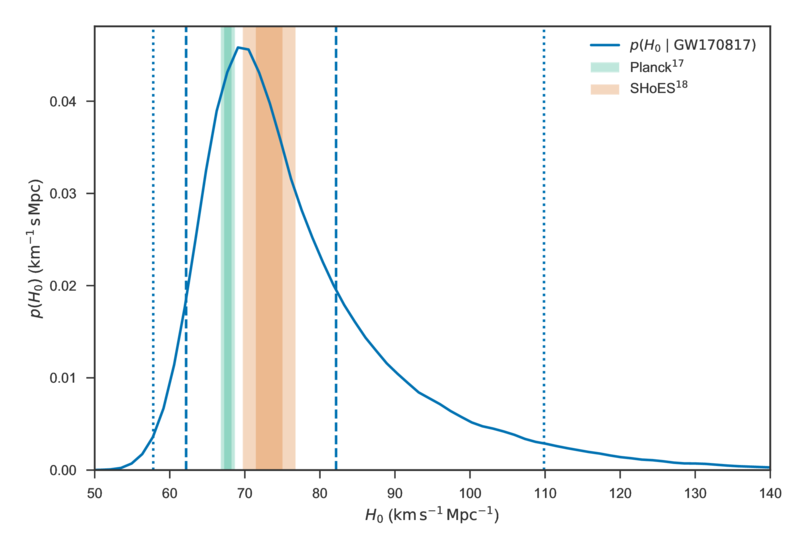 The blue bars show O1 limits, the green and orange bars show projections for future observing runs. Figures 6 and 7 from the O1 Binary Neutron Star/Neutron Star–Black Hole Paper. Binary neutron star or neutron star–black hole mergers may be the sources of gamma-ray bursts. These are some of the most energetic explosions in the Universe, but we’re not sure where they come from (I actually find that kind of worrying). 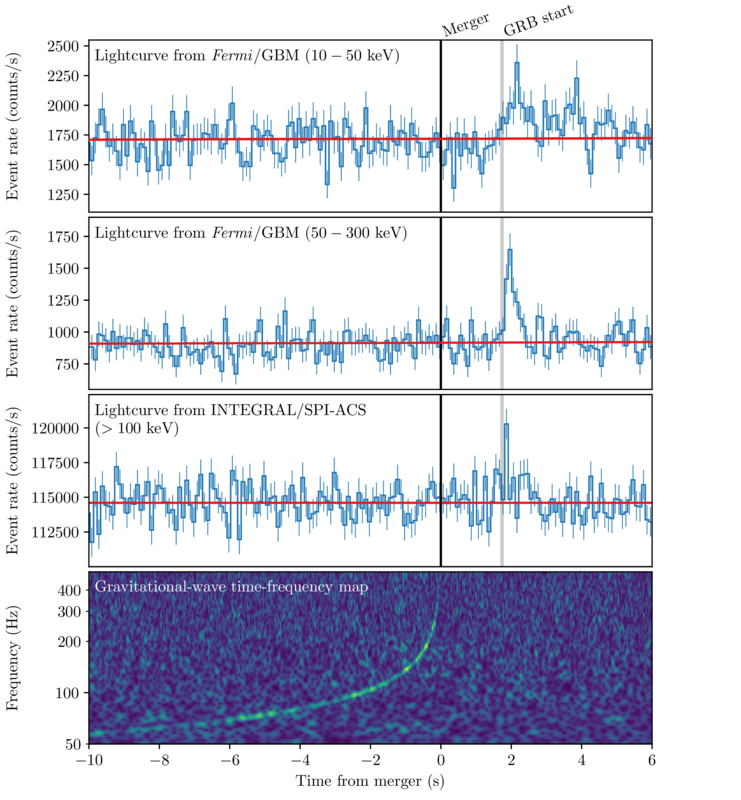 We look at this connection a bit more in the O1 Gamma-Ray Burst Paper. The theory is that during the merger, neutron star matter gets ripped apart, squeezed and heated, and as part of this we get jets blasted outwards from the swirling material. There are always jets in these type of things. We see the gamma-ray burst if we are looking down the jet: the wider the jet, the larger the fraction of gamma-ray bursts we see. By comparing our estimated merger rates, with the estimated rate of gamma-ray bursts, we can place some lower limits on the opening angle of the jet. If all gamma-ray bursts come from binary neutron stars, the opening angle needs to be bigger than and if they all come from neutron star–black hole mergers the angle needs to be bigger than . Gamma-ray bursts are extremely violent explosions. They come in two (overlapping) classes: short and long. Short gamma-ray bursts are typically shorter than ~2 seconds and have a harder spectrum (more high energy emission). We think that these may come from the coalescence of neutron star binaries. Long gamma-ray bursts are (shockingly) typically longer than ~2 seconds, and have a softer spectrum (less high energy emission). We think that these could originate from the collapse of massive stars (like a supernova explosion). The introduction of the paper contains a neat review of the physics of both these types of sources. Both types of progenitors would emit gravitational waves that could be detected if the source was close enough. 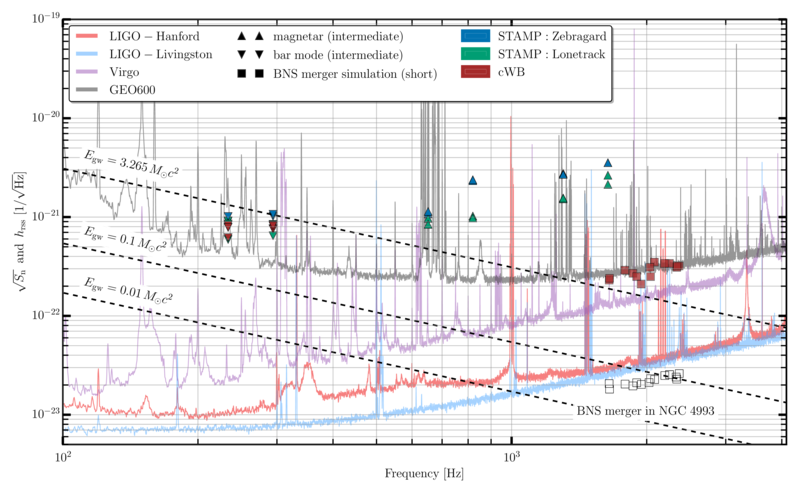 The binary mergers could be picked up by our templated search (as reported in the O1 Binary Neutron Star/Neutron Star–Black Hole Paper): we have a good models for what these signals look like, which allows us to efficiently search for them. 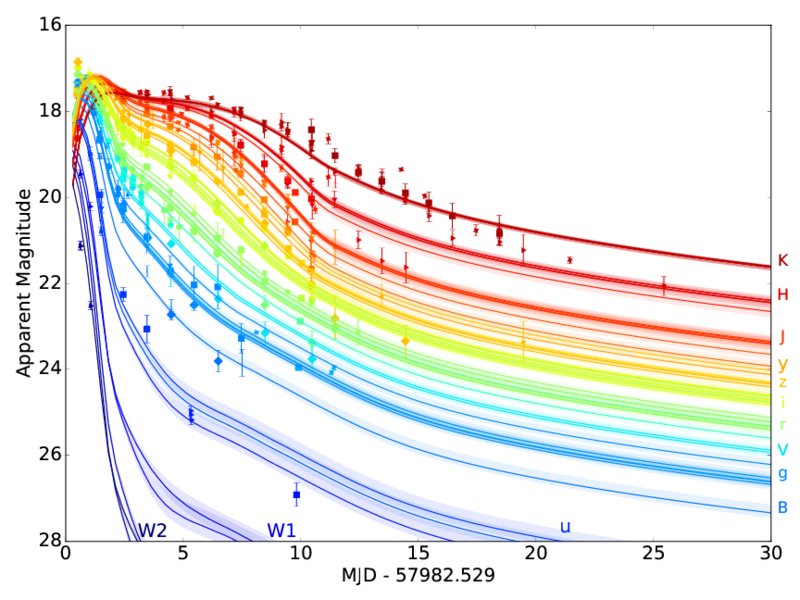 We don’t have good models for the collapse of stars, but our unmodelled searches could pick these up. These look for the same signal in multiple detectors, but since they don’t know what they are looking for, it is harder to distinguish a signal from noise than for the templated search. Cross-referencing our usual searches with the times of gamma-ray bursts could help us boost the significance of a trigger: it might not be noteworthy as just a weak gravitational-wave (or gamma-ray) candidate, but considering them together makes it much more unlikely that a coincidence would happen by chance. The on-line RAVEN pipeline monitors for alerts to minimise the chance that miss a coincidence. As well as relying on our standard searches, we also do targeted searches following up on gamma-ray bursts, using the information from these external triggers. X-Pipeline is an unmodelled search (similar to cWB) which looks for a coherent signal, consistent with the sky position of the gamma-ray burst. This was run for all the gamma-ray bursts (long and short) for which we have good data from both LIGO detectors and a good sky location. PyGRB is a modelled search which looks for binary signals using templates. Our main binary search algorithms check for coincident signals: a signal matching the same template in both detectors with compatible times. This search looks for coherent signals, factoring the source direction. This gives extra sensitivity (~20%–25% in terms of distance). Since we know what the signal looks like, we can also use this algorithm to look for signals when only one detector is taking data. We used this algorithm on all short (or ambiguously classified) gamma-ray bursts for which we data from at least one detector. In total we analysed times corresponding to 42 gamma-ray bursts: 41 which occurred during O1 plus GRB 150906B. This happening in the engineering run before the start of O1, and luckily Handord was in a stable observing state at the time. GRB 150906B was localised to come from part of the sky close to the galaxy NGC 3313, which is only 54 megaparsec away. This is within the regime where we could have detected a binary merger. This caused much excitement at the time—people thought that this could be the most interesting result of O1—but this dampened down a week later with the detection of GW150914. 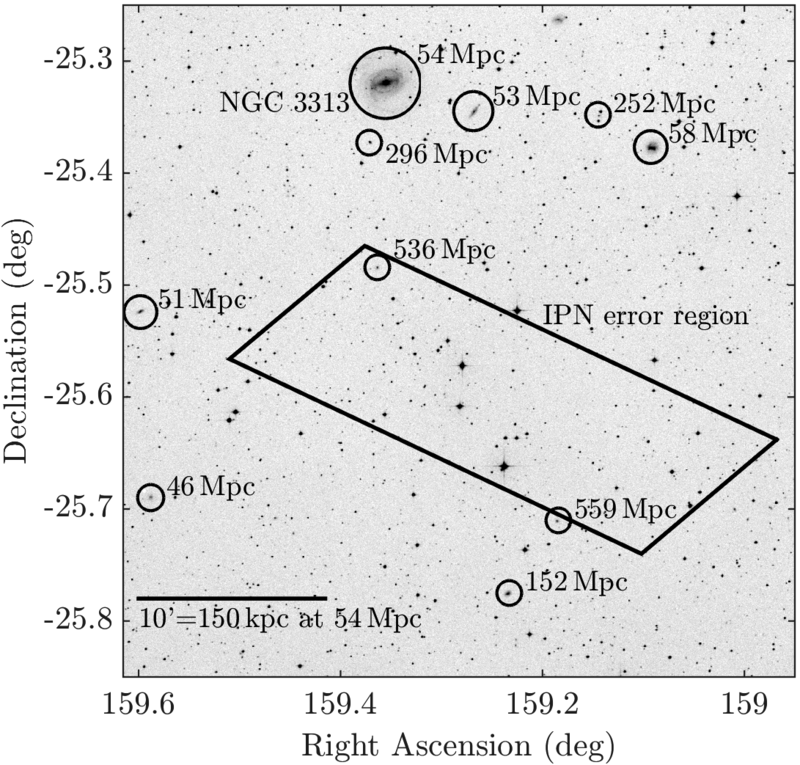 Interplanetary Network (IPN) localization for GRB 150906B and nearby galaxies. 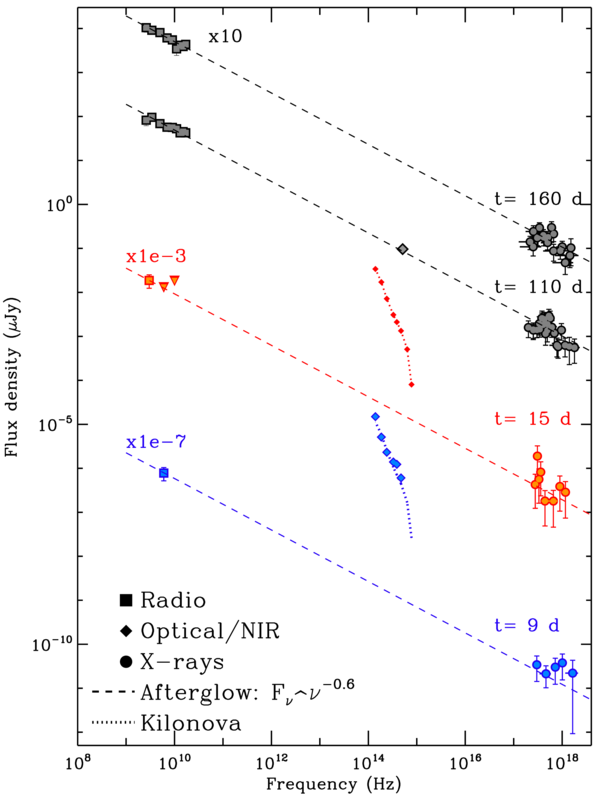 Figure 1 from the O1 Gamma-Ray Burst Paper. 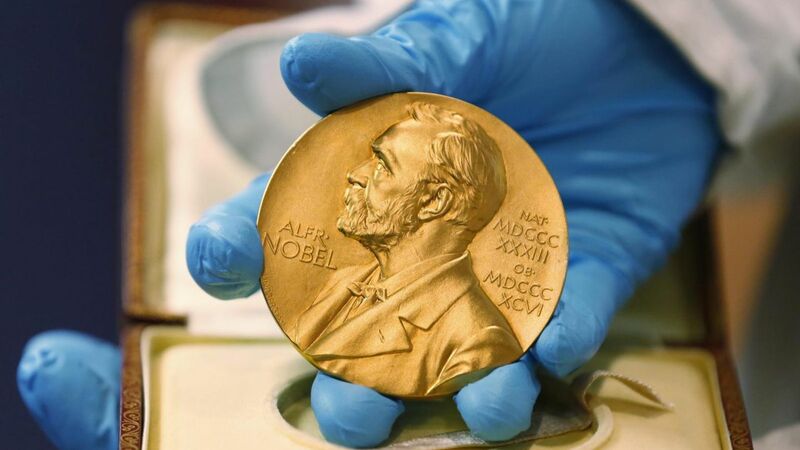 We didn’t find any gravitational-wave counterparts. These means that we could place some lower limits on how far away their sources could be. 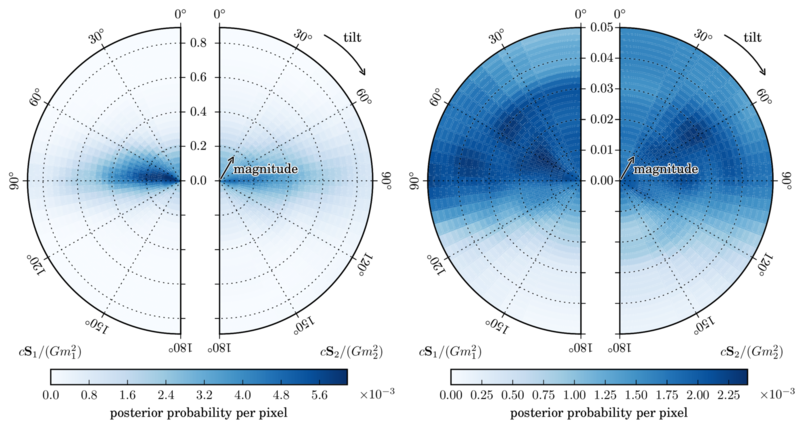 We performed injections of signals—using waveforms from binaries, collapsing stars (approximated with circular sine–Gaussian waveforms), and unstable discs (using an accretion disc instability model)—to see how far away we could have detected a signal, and set 90% probability limits on the distances (see Table 3 of the paper). The best of these are ~100–200 megaparsec (the worst is just 4 megaparsec, which is basically next door). 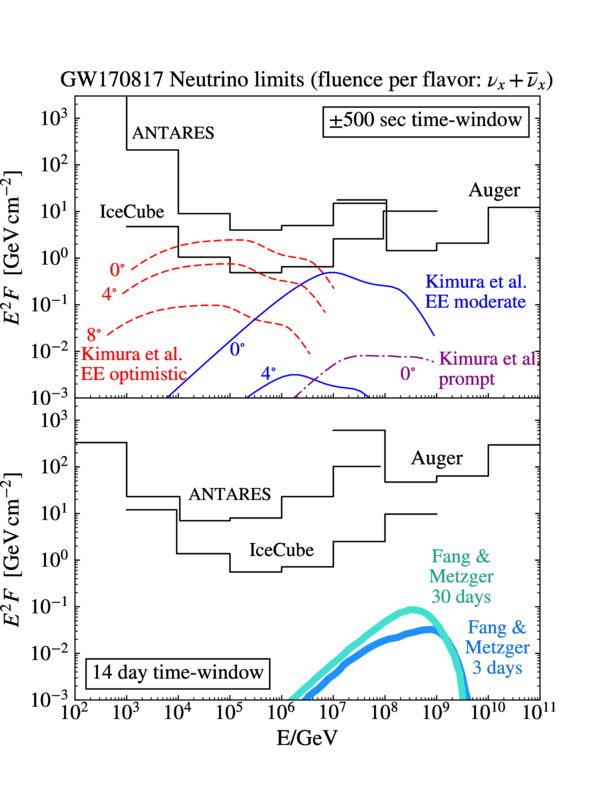 These results aren’t too interesting yet, they will become more so in the future, and around the time we hit design sensitivity we will start overlapping with electromagnetic measurements of distances for short gamma-ray bursts. However, we can rule out GRB 150906B coming from NGC 3133 at high probability! Black holes could come in many sizes. We know of stellar-mass black holes, the collapsed remains of dead stars, which are a few to a few tens of times the mas of our Sun, and we know of (super)massive black holes, lurking in the centres of galaxies, which are tens of thousands to billions of times the mass of our Sun. Between the two, lie the elusive intermediate mass black holes. There have been repeated claims of observational evidence for their existence, but these are notoriously difficult to confirm. Gravitational waves provide a means of confirming the reality of intermediate mass black holes, if they do exist. The gravitational wave signal emitted by a binary depends upon the mass of its components. More massive objects produce louder signals, but these signals also end at lower frequencies. The merger frequency of a binary is inversely proportional to the total mass. Ground-based detectors can’t detect massive black hole binaries as they are too low frequency, but they can detect binaries of a few hundred solar masses. We look for these in this search. Our flagship search for binary black holes looks for signals using matched filtering: we compare the data to a bank of template waveforms. The bank extends up to a total mass of 100 solar masses. This search continues above this (there’s actually some overlap as we didn’t want to miss anything, but we shouldn’t have worried). Higher mass binaries are hard to detect as they as shorter, and so more difficult to distinguish from a little blip of noise, which is why this search was treated differently. As well as using templates, we can do an unmodelled (burst) search for signals by looking for coherent signals in both detectors. This type of search isn’t as sensitive, as you don’t know what you are looking for, but can pick up short signals (like GW150914). Our search for intermediate mass black holes uses both a modelled search (with templates spanning total masses of 50 to 600 solar masses) and a specially tuned burst search. Both make sure to include low frequency data in their analysis. This work is one of the few cross-working group (CBC for the templated search, and Burst for the unmodelled) projects, and I was pleased with the results. 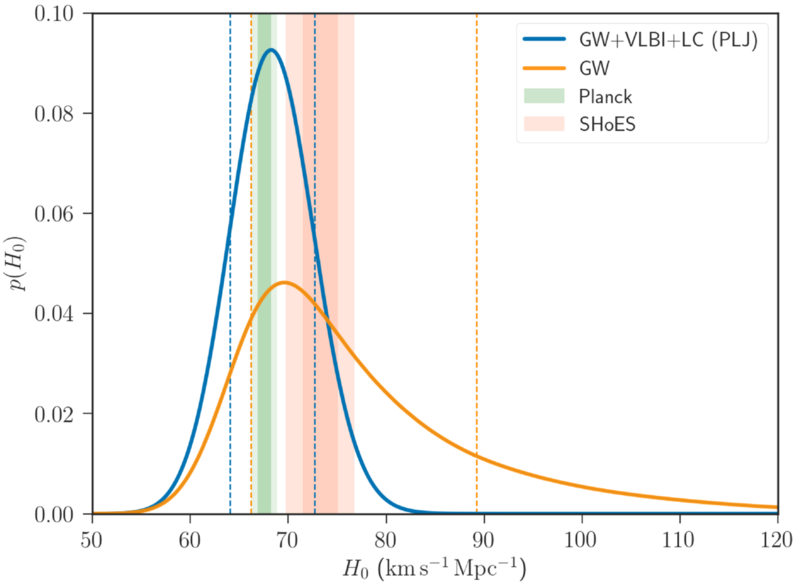 To set our upper limits, we injected some signals from binaries with specific masses and spins, and then saw how many would have be found with greater significance than our most significant trigger (after excluding GW150914, LVT151012 and GW151226). This is effectively asking the question of when would we see something as significant as this trigger which we think is just noise. This gives us a sensitive time–volume which we have surveyed and found no mergers. We use this number of events to set 90% upper limits on the merge rates , and define an effective distance defined so that where is the analysed amount of time. The plot below show our limits on rate and effective distance for our different injections. 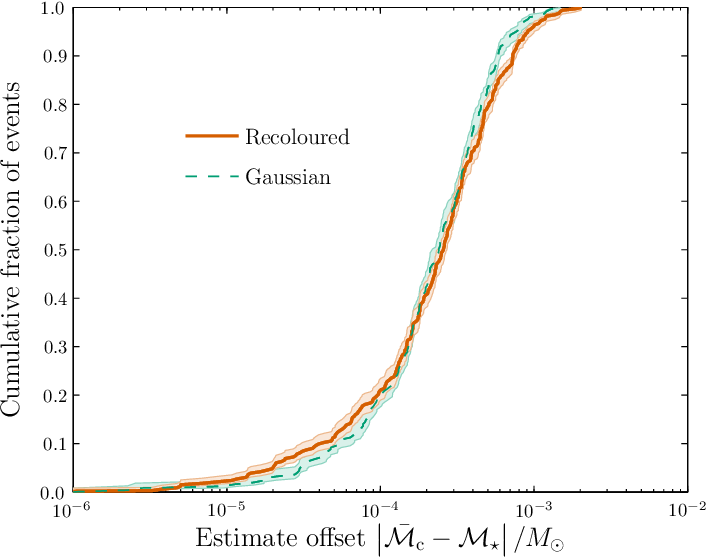 Results from the O1 search for intermediate mass black hole binaries. The left panel shows the 90% confidence upper limit on the merger rate. The right panel shows the effective search distance. Each circle is a different injection. All have zero spin, except two 100+100 solar mass sets, where indicates the spin aligned with the orbital angular momentum. Figure 2 of the O1 Intermediate Mass Black Hole Binary Paper. There are a couple of caveats associated with our limits. The waveforms we use don’t include all the relevant physics (like orbital eccentricity and spin precession). Including everything is hard: we may use some numerical relativity waveforms in the future. However, they should give a good impression on our sensitivity. There’s quite a big improvement compared to previous searches (S6 Burst Search; S6 Templated Search). 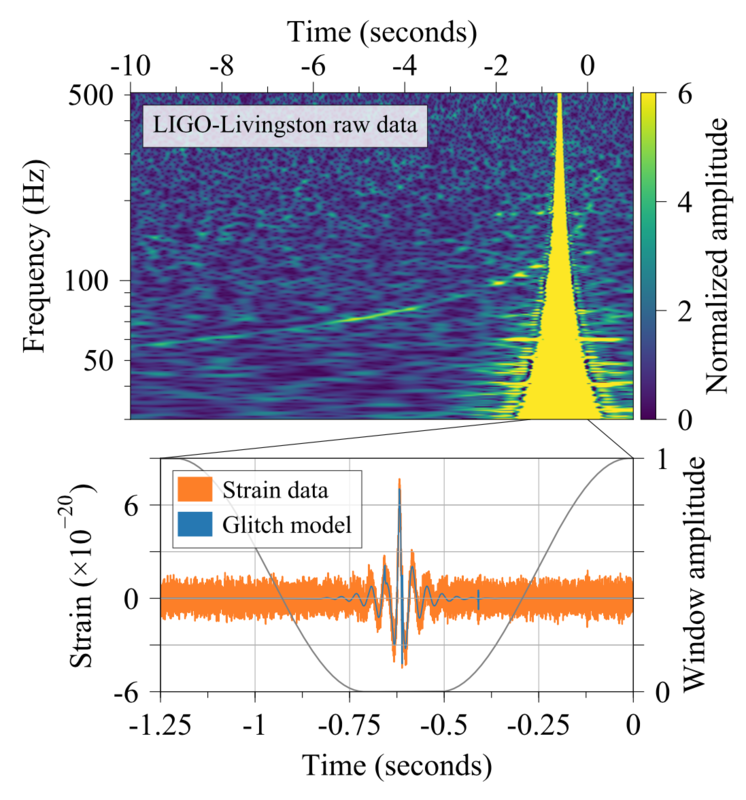 This comes form the improvement of Advanced LIGO’s sensitivity at low frequencies compared to initial LIGO. Future improvements to the low frequency sensitivity should increase our probability of making a detection. I spent a lot of time working on this search as I was the review chair. As a reviewer, I had to make sure everything was done properly, and then reported accurately. I think our review team did a thorough job. I was glad when we were done, as I dislike being the bad cop. The best way to find a signal is to know what you are looking for. This makes it much easier to distinguish a signal from random noise. However, what about the sources for which we don’t have good models? Burst searches aim to find signals regardless of their shape. To do this, they look for coherent signals in multiple detectors. Their flexibility means that they are less sensitive than searches targeting a specific signal—the signal needs to be louder before we can be confident in distinguishing it from noise—but they could potentially detect a wider number of sources, and crucially catch signals missed by other searches. This paper presents our main results looking for short burst signals (up to a few seconds in length). 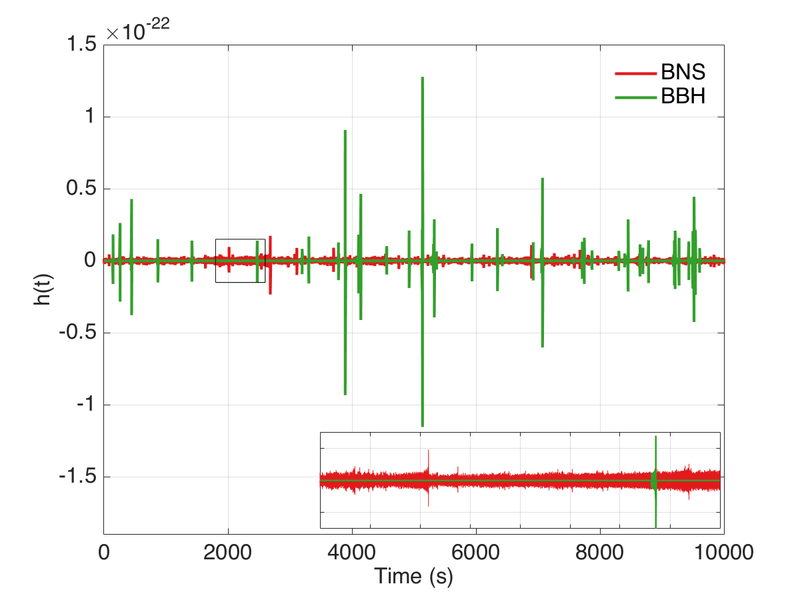 Complementary burst searches were done as part of the search for intermediate mass black hole binaries (whose signals can be so short that it doesn’t matter too much if you have a model or not) and for counterparts to gamma-ray bursts. There are two-and-a-half burst search pipelines. 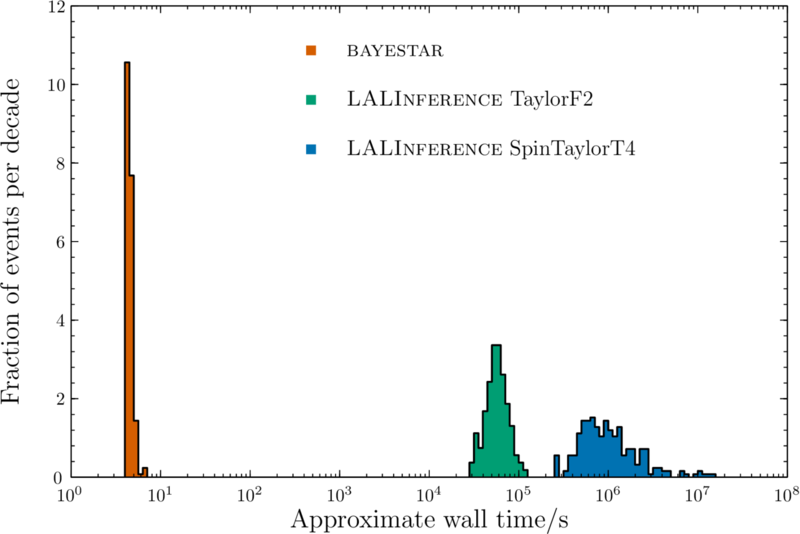 There is coherent WaveBurst (cWB), Omicron–LALInferenceBurst (oLIB), and BayesWave follow-up to cWB. 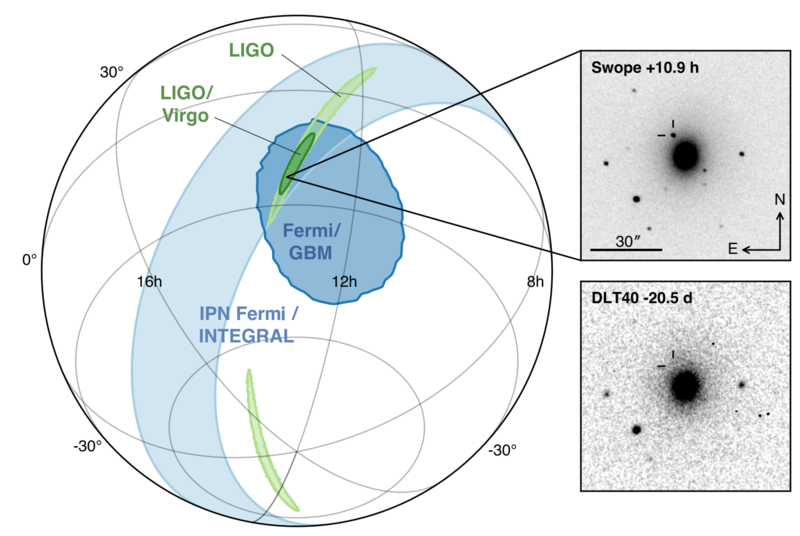 More details of each are found in the GW150914 Burst Companion Paper. C1 for signals which have a small range of frequencies (80% of the power in just a 5 Hz range). This is designed to catch blip glitches, short bursts of transient noise in our detectors. We’re not sure what causes blip glitches yet, but we know they are not real signals as they are seen independently in both detectors. C3 looks for signals which increase in frequency with time—chirps. 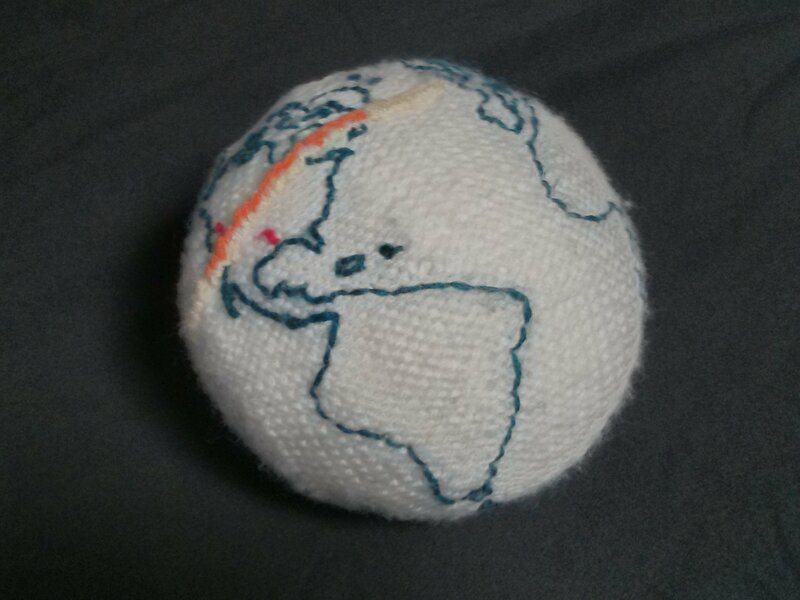 I suspect that this was (cheekily) designed to find binary black hole coalescences. C2 (no, I don’t understand the ordering either) is everything else. The false alarm rate is calculated independently for each division using time-slides. We analyse data from the two detectors which has been shifted in time, so that there can be no real coincident signals between the two, and compare this background of noise-only triggers to the no-slid data. oLIB works in two stages. First (the Omicron bit), data from the individual detectors are searches for excess power. If there is anything interesting, the data from both detectors are analysed coherently. 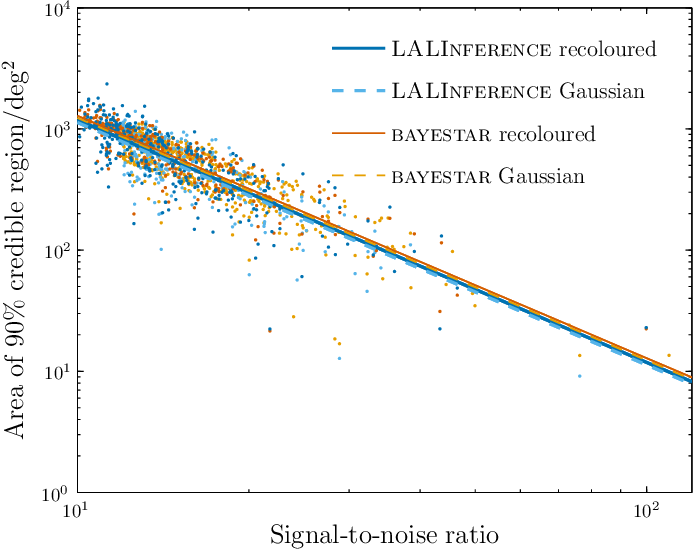 We use a sine–Gaussian template, and compare the probability that the same signal is in both detectors, to there being independent noise (potentially a glitch) in the two. This analysis is split too: there is a high-quality factor vs low quality-factor split, which is similar to cWB’s splitting off C1 to catch narrow band features (the low quality-factor group catches the blip glitches). The false alarm rate is computed with time slides. BayesWave is run as follow-up to triggers produced by cWB: it is too computationally expensive to run on all the data. 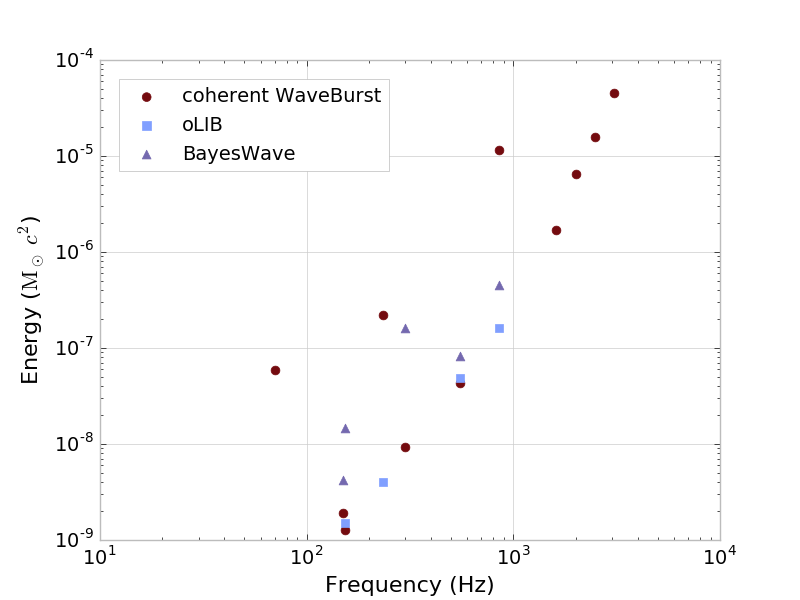 BayesWave’s approach is similar to oLIB’s. It compares three hypotheses: just Gaussian noise, Gaussian noise and a glitch, and Gaussian noise and a signal. It constructs its signal using a variable number of sine–Gaussian wavelets. There are no cuts on its data. Again, time slides are used to estimate the false alarm rate. The search does find a signal: GW150914. It is clearly found by all three algorithms. It is cWB’s C3, with a false alarm rate of less than 1 per 350 years; it is is oLIB’s high quality-factor bin with a false alarm rate of less than 1 per 230 years, and is found by BayesWave with a false alarm rate of less than 1 per 1000 years. You might notice that these results are less stringent than in the initial search results presented at the time of the detection. 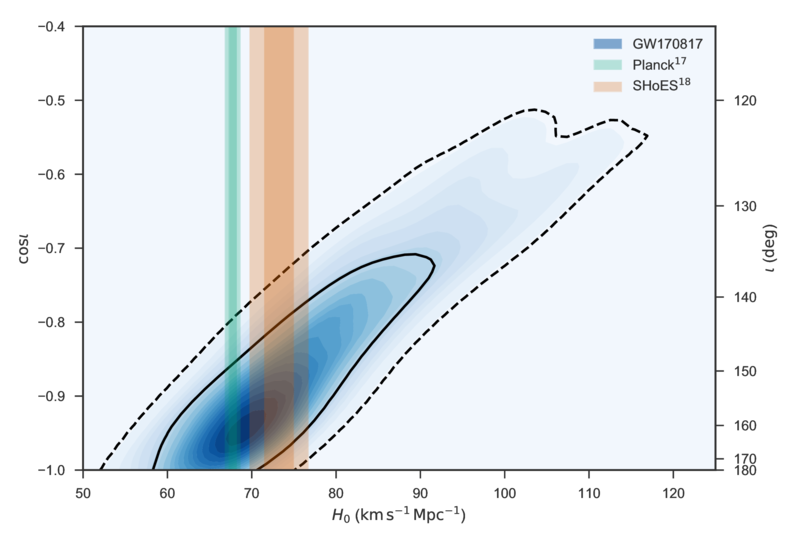 This is because only a limited number of time slides were done: we could get higher significance if we did more, but it was decided that it wasn’t worth the extra computing time, as we’re already convinced that GW150914 is a real signal. I’m a little sad they took GW150914 out of their plots (I guess it distorted the scale since it’s such an outlier from the background). Aside from GW150914, there are no detections. Given the lack of detections, we can set some upper limits. I’ll skip over the limits for binary black holes, since our templated search is more sensitive here. 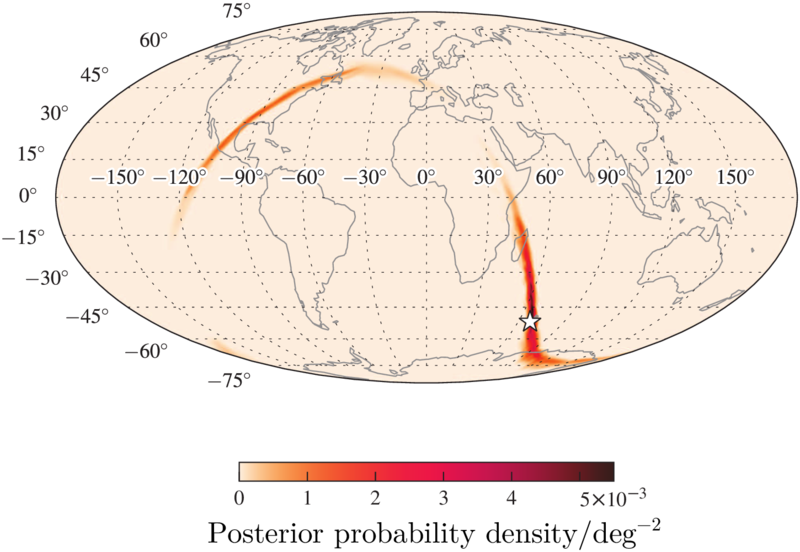 The plot below shows limits on the amount of gravitational-wave energy emitted by a burst source at 10 kpc, which could be detected with a false alarm rate of 1 per century 50% of the time. We use some simple waveforms for this calculation. The energy scales with the inverse distance squared, so at a distance of 20 kpc, you need to increase the energy by a factor of 4. Gravitational-wave energy at 50% detection efficiency for standard sources at a distance of 10 kpc. Results are shown for the three different algorithms. Figure 2 of the O1 Burst Paper.